A career night from outside hitter Tessa Grubbs was not enough to help Tennessee escape Johnson City with a victory on Tuesday. 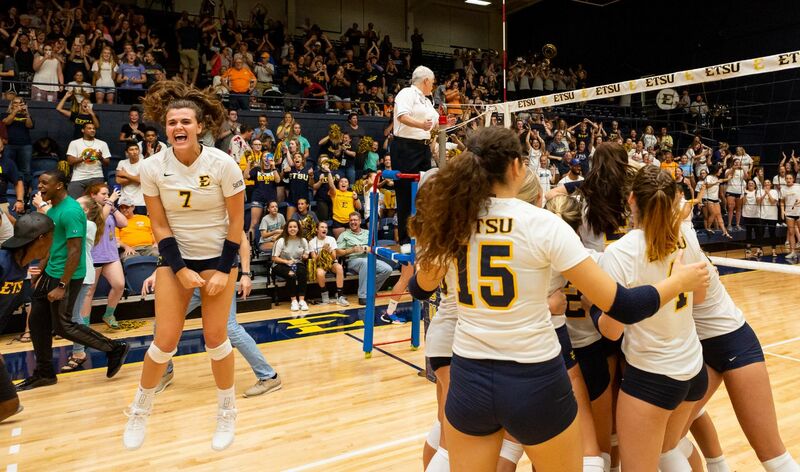 Instead it was the host East Tennesee State Bucs who pulled off a comeback, including a rally from down 7-0 in Set 5, to thrill the crowd of 2,016 inside Brooks Gym. This is the second straight win in the series between the Buc and the Vols with the last coming in 2013 in a four-set victory. It Was Over When: After falling behind 2-1 in the match, ETSU flipped a switch in Set 4, cruising to a 6-2 lead including two kills and a block by Kaela Massey. The Vols narrowed the gap to two eight times, last at 16-14, but could not break through. An 8-3 run, including kills by four different players, put ETSU on the brink of a fifth set at 24-17. Tennessee thwarted two set point tries, before a service error leveled the match at two sets apiece. The Vols appeared to have regained their form in Set 5, opening the stanza with seven straight points, including four putaways by Tessa Grubbs. The Bucs climbed back into it with two AJ Lux kills and an Alyssa Kvarta ace. Massey fired up the crowd with a solo stuff of Grubbs (see video below) to make it 7-4 and tacked on two more kills to push ETSU out to a 9-7 advantage. Kvarta served up eight points in the run. Tennessee recovered with back to back Grubbs kills to tie it up, but the momentum belonged to the home side, who would not trail the rest of the way. The teams traded two-point runs, leading to a tieup at 11, but ETSU outscored the Vols 4-1 down the stretch to close out the comeback. Massey, Braedyn Tutton and Leah Clayton notched kills to give the Bucs a match-point try at 14-11. A Madison Coulter putaway kept the set going momentarily, but Clayton brought down the house with the final blow at 15-12. Key Stats: ETSU outhit Tennessee .201 to .146 in the match, including a .375 to .025 in Set 4 and a .259 to .103 edge in the finale. The Bucs also outdid the Vols in kills (62-59), aces (4-2) and digs (88-86). Both teams managed 12 blocks. Stat Leaders: Kaela Massey led the way for ETSU with a 16-kill, 14-dig double-double, the first of her career, to go with four blocks, while hitting at a team-best .379 clip. Leah Clayton and AJ Lux tacked on 15 putaways apiece. Mariah McParland chipped in seven kills and a team-leading six stuffs. Alyssa Kvarta notched a 47-assist, 21-dig double-double. Grubb notched 25 kills, five digs and two blocks to pace Tennessee, but her nearest help came from a pair of eight-putdown efforts by Erica Treiber and Madison Coulter. Treiber also accounted for a match-high nine blocks, while Addisyn Rowe added seven putaways.